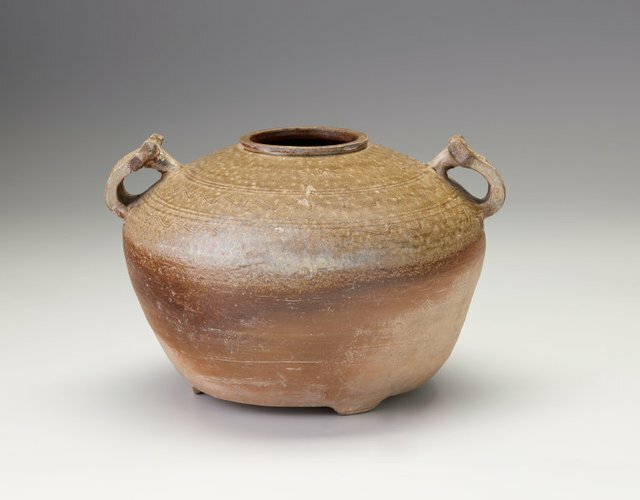 This piece is a typical example of the food storage jars found in tombs in the eastern region of China, from north Jiangsu to central Zhejiang and west into Anhui. It has three feet and two moulded stylised animal mask handles, with two concentric bands of a combed wavy pattern decorating the upper part which is also covered with an olive glaze. From similar extant examples, we can ascertain that these jars were originally made with covers that had a central knob. Like other Han ceramic shapes, there was a bronze prototype for this shape, an obvious legacy of which is to be seen in the mask handles on the jar. Early examples were made purely as funerary vessels (some have been found labelled and still containing foodstuffs in burial), but later pieces apparently served as storage jars and food containers in this life as well. From the technical point of view, pieces of a large class of high-fired stoneware with a feldspathic body, which, before the existence of earlier glazed stonewares of the Shang dynasty was documented, were given the name "proto-porcelain" to indicate that they represented, in essence, the beginnings of porcelain. They are the ancestors of Yue type celadons and the porcellaneous Tang wares.